If you want to lose weight, running is one of the best ways to do it, as running burns more calories than any other form of cardio exercise. If your goal is to lose 10 pounds, the amount of running you need to do depends on your current weight and the speed at which you run. You can determine the right amount of running to meet your weight-loss goals with some caloric calculations. The formula for losing weight is burning more calories than you consume each day. A pound is equivalent to about 3,500 calories, so if you burn an extra 500 calories in a day, you will lose one pound in a week. The Centers for Disease Control and Prevention recommends losing one to two pounds per week for a healthy, sustainable rate of weight loss. If you lose weight more quickly, you will be more likely to gain it back and may also be in danger of nutritional deficiencies. Running can help you burn calories each day to help you lose 10 pounds. Set weekly milestones to break down your 10-pound weight-loss goal by aiming to lose one or two pounds per week. The amount of calories you burn each week will depend on your running plan. In general, the more you weigh, the more calories you will burn running. A 200-pound person who runs for 30 minutes at 6 miles per hour, for instance, burns about 456 calories, whereas a 150-pound person burns 342 calories doing the same run. You can get an estimate of how many calories you burn running by using HealthStatus.com's calories-burned calculator (see Resources). The higher your intensity while running, the more calories you will burn. So, if you run faster, you will burn more calories. 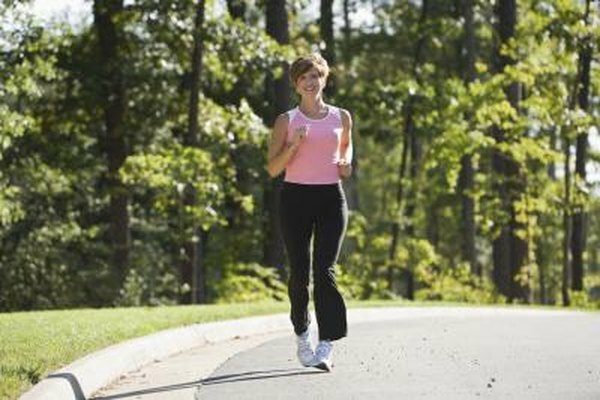 A 150-pound person who runs for 30 minutes at 6 miles per hour pace burns about 342 calories, but if she steps up her pace to run at 8 miles per hour, she will burn about 458 calories. You can adjust your pace to meet your daily calorie-burning goals. If you run fast one day, allow yourself an easier, slower pace the next day to recover. In addition to your weight and running speed, your calorie burning will be determined by how long you run. The longer you run, the more calories you will burn. You may want to consider doing one long run a week to burn extra calories, or extend your daily runs by an extra half mile or mile to speed up your weight loss. Be careful not to overwork yourself, however, and allow yourself one day of rest or cross-training a week so your body can recover from running.